Do you know how to code for gunshot wounds in ICD-10? In this article, you will learn the definition of a firearm-related injury, the physical characteristics of a gunshot wound and the damage it causes. You will also be given a coding example and learn how to assign the appropriate ICD-10-CM codes based on the coding guidelines. Firearm-related injuries are a major public health problem in the United States, contributing significantly each year to premature death, illness, and impairment. In addition to the physical problems that result from a gunshot injury, there are also traumatic emotional scars that can be caused by such a devastating event. What is a Firearm-Related Injury? A firearm-related injury is defined as a gunshot wound or penetrating injury from a weapon that uses a powder charge to fire a projectile. These gunshot injuries stem from handguns, rifles, and shotguns, according to the National Institutes of Health. Air-powered, gas-powered, pellet and BB guns are not included in this definition and are not considered firearm-related injuries. Nor are non-penetrating injuries related to firearms, such as pistol whipping. Entrance and exit wounds are often caused by an individual being shot by someone with a firearm. A bullet enters the body and then exits through another area of the body, leaving entrance and exit wounds. According to Explore Forensics, in some cases, the entrance and exit wounds are clean, and the bullet travels through the body and causes only superficial damage. However, the overall wounding pattern is often based on how close the assailant is to the victim, the type of weapon, and the number of rounds fired from the weapon. If the bullet hits a bone, the bone may break into pieces, or the bullet may ricochet and take a different path, according to the National Institutes of Health. An “open wound” is a very broad term that can refer to many types of wounds, such as abrasions, lacerations, incisions, punctures, and penetrating wounds. 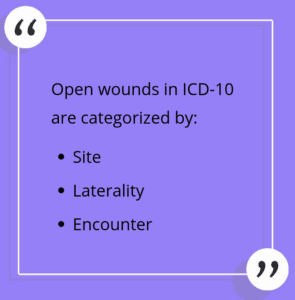 Each of these types of wounds has a different ICD-10-CM code. Therefore, the term “open wound” should be avoided when reporting a diagnosis. A gunshot wound is a penetrating wound or a puncture wound. It is also a traumatic wound. Penetrating wounds are caused by any object or force that breaks through or punctures the skin to the underlying organs or tissue. These wounds vary in size, shape, and presentation, depending on the cause. Laterality. The right or left side of the body. Encounter. The 7th character extender, being initial, subsequent, or sequela. Initial encounter is a visit to determine what treatment is required to repair the wound. Sequela is a complication or condition that occurs as a result of the wound. A 27-year-old patient was brought to the hospital with a gunshot wound to the right thigh. Further details of the event were not provided, and the intent could not be determined. Assign the correct ICD-10-CM codes. According to ICD-10-CM Coding Guidelines, traumatic injury codes (S00-T14.9) should not be used for normal, healing surgical wounds or to identify complications of surgical wounds. To code for the puncture wound, we may look in the ICD-10-CM coding manual Index under Puncture, or we may start with looking under Penetrating wound, which refers you to Puncture. Puncture is broken down by body site, then laterality, and with and without foreign body. There is nothing to indicate a foreign body is involved here, so we need to go to Puncture, thigh, right S71.131. When verifying S71.131 in the Tabular, S71.131 refers to Puncture wound without foreign body, right thigh. There is also a note at S71 that indicates we need a 7th character to show whether it is an initial encounter, subsequent encounter, or sequela. This is an initial encounter and the patient is receiving active treatment; hence, we need to add ‘A’ to S71.131, making it S71.131A. Be sure to read all parenthetical notes at S71 as to ‘Code also’ and ‘Excludes1’ and ‘Excludes 2’ notes for any additional coding instructions. Are we done? No, we have only told part of the story. We still need to code for the external cause of morbidity. External cause codes describe the cause of the injury, the intent (unintentional or accidental; or intentional, such as suicide or assault), place of occurrence, the activity of the patient at the time of the event, and the person’s status (e.g., civilian or military). The number of reportable external cause codes is based on the documentation provided. A gunshot wound may be accidental, self-inflicted, or due to assault. External cause codes are never sequenced as a first-listed or principal diagnosis. Based on the documentation provided in the above coding example, we know a gunshot wound was the cause of the injury, but we don’t know the specific type of firearm used. We also don’t know if the gunshot wound was accidental, self-inflicted, or due to assault. Documentation indicates the intent of the gunshot wound could not be determined. Therefore, we need to use an ‘unspecified’ code. In the External Cause of Injuries Index, look up Discharge, firearm, stated as undetermined whether accidental or intentional Y24.9. Verified in the Tabular, Y24.9 refers to Unspecified firearm discharge, undetermined intent. There is a note at Y24 that indicates a 7th character is needed for the episode of care. Therefore, Y24.9XXA is the correct code to show it is an initial encounter. There are many other possible external cause codes related to firearm-related injuries. See below. U01.4 – Terrorism involving firearms (homicide, completed or attempted). A rarely used, provisional category. With over 67,000 persons being injured by firearms each year, it is likely that you will come across a patient encounter of this type in your day-to-day coding. 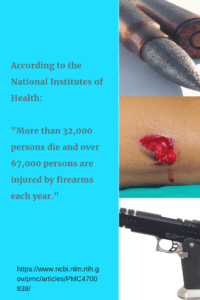 Therefore, it is imperative that you understand how to code for firearm-related injuries and their external causes and know that a gunshot wound is a penetrating wound that occurs when a bullet punctures the skin to the organs or tissue. Knowing your guidelines is critical. Can You Name That Medical Term Ending in algia?